Propertybuyer is a proud supporter of several charities. We believe it is important for any company to not only provide excellent service, but to also act as a good corporate citizen. A proportion of all fees goes towards supporting our selected charities. We are keen sponsors of World Vision and Childcare Kitgum servants in Uganda. Both these organizations provide material support for disadvantaged children growing up in very poor areas. We have been consistent supporters of the wonderful work of World Vision for over 15 years. Last year we donated to the Children’s Hospital at Westmead and sponsored a runner in the half marathon raising money for the Cancer Council. We also donate to the Red Cross, Heart Foundation, Salvation Army, local youth charities and others. 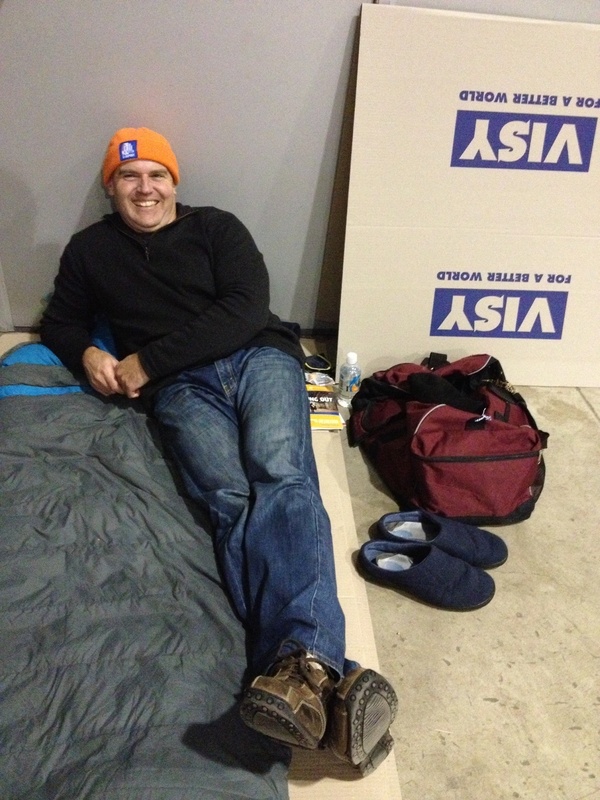 We also sent our CEO Rich Harvey to sleep out on the streets on night to help raise money for St Vinnies winter appeal! "In 2017, I joined business and community leaders from around Australia to take part in the 2017 Vinnies CEO Sleepout, raising awareness and vital funds to support services for the thousands of men, women and children experiencing homelessness across the country. It will be cold and I will be taking my beanie! This will be the sixth year I have participated. I feel a personal obligation to help those that are doing it tough and would greatly appreciate your support." Each year of participation, Rich joins over a thousand business leaders across Australia raising awareness of homelessness at the Vinnies CEO Sleepouts. "As I’m in the business of helping put a roof over peoples’ heads, it’s a privilege to help Vinnies with a great cause to raise money for those on the street. Anyone can end up on the street due a series of unfortunate circumstances. Each year I attend I am amazed at the stories of ordinary people that suddenly find themselves on the street from a series of tragic or unfortunate events that are no fault of their own." All money raised goes towards helping the estimated 105,000 men, women and children experiencing homelessness in Australia. These funds will help them find the warmth, safety and dignity that they desperately deserve. Every bit big or small helps. 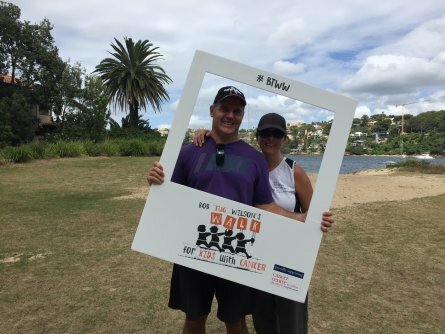 We did the 28km walk for to help raise money for The Children’s Cancer Centre at The Children’s Hospital at Westmead. on Sunday 20th March 2016. We did it in about 6.5 hours and although our legs and feet were feeling very sore after it was very worth it. In 2015, I walked 30 kilometres to help raise money for The Children’s Cancer Centre at The Children’s Hospital at Westmead. Each year in NSW approximately 250 new children are diagnosed with cancer. The Children’s Hospital at Westmead is responsible for the care of between 120 and 150 of these new patients and their families. Since 1976 more than 3,000 children have received treatment for cancer at The Children’s Hospital and more than 2,200 of these patients are long-term survivors. I sincerely appreciate your generous donations. At the end of November I travelled to Manado (North Sulawesi, East Indonesia) for 10 days with a group of people to support a Christian micro enterprise development organisation called Bridge of Hope. Bridge of Hope provides small loans of between $100 to $200 to assist family businesses in growing their business and escape the poverty cycle. It was so hot and humid there you feel like you were operating at half speed. We presented some leadership training to the staff on time management, communication and effective listening skills and also ran a staff retreat which they thoroughly enjoyed. We visited some of the villages where the family businesses reside. I was struck by how simple their lifestyle is, yet they have such a positive outlook on life. They are mostly simple food based and product based businesses with little diversification. Yet the small loan makes such a difference – they are able to triple or quadruple their production and therefore make more profit to expand their business capital. This in turn enables them to be more self reliant and provide more for their extended families. Another sad but insightful point of the trip was visiting the local rubbish dump at Somompo. We spent time with some of the kids that pick over the dump for recycled material. Bridge of Hope have built an small education centre to help educate some of the kids there that would otherwise not get to school because their parents insist they work the dump. My wife and two boys really enjoyed the trip and it gave them a new perspective on just how privileged we are to live in Australia. On the funny side- my youngest son Sam was very popular as he was often mistaken for Justin Beiber as he had a similar hair cut and looks! The next step is to complete your Property Brief. This will help us not only start researching listings which cater to your specific needs, but also match you with the buyers agent most experienced in your category. Once you've filled in the form and hit send we'll contact you to arrange a meeting where we can discuss your choices in more detail and talk about the next steps.